Mt. 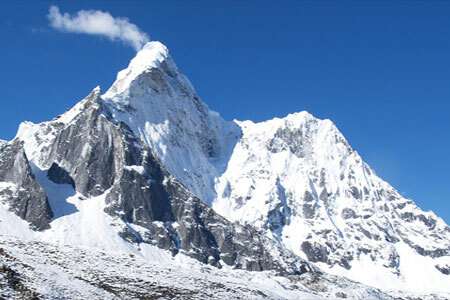 Pumari ExpeditionPumori is one of the premier 7,165m peaks in the Everest region of Nepal. It is ideal for those looking to go on to attempt 8000m peaks, but is a fantastic climb in its own right. The route follows the south-east buttress before traversing to the East Ridge for the remainder of the ascent. Requiring excellent physical endurance, Pumori is a serious expedition peak designed only for experienced climbers. 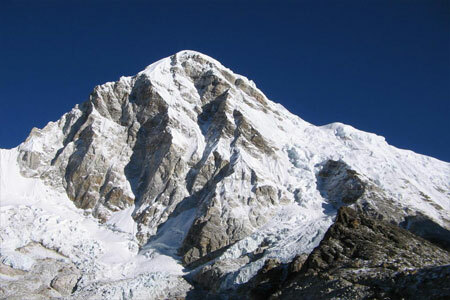 For our Pumori climb Base Camp will be set up at 5,300m. 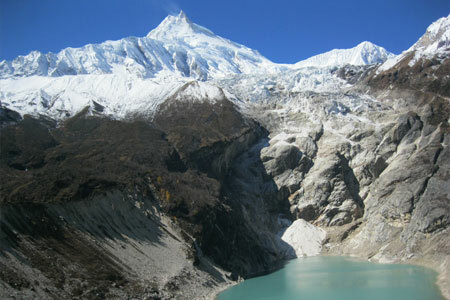 From it we climb across glaciers for approximately 4 hours and reach Camp 1 at 5,700m. 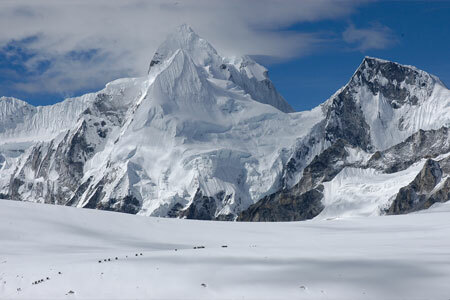 From Camp 1 we climb a 40-60 degree slope to reach Camp 2 set on a narrow ridge at 6,200m. From here we climb ice of 30-60 degrees passing ice walls and crevasses. This section of the route is prone to avalanches started by the collapse of big seracs hanging on the shoulder above. 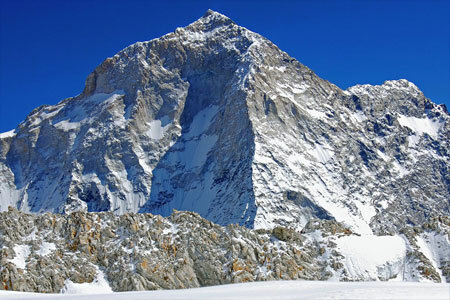 Camp 3 will be set up at an altitude of 6,480m. 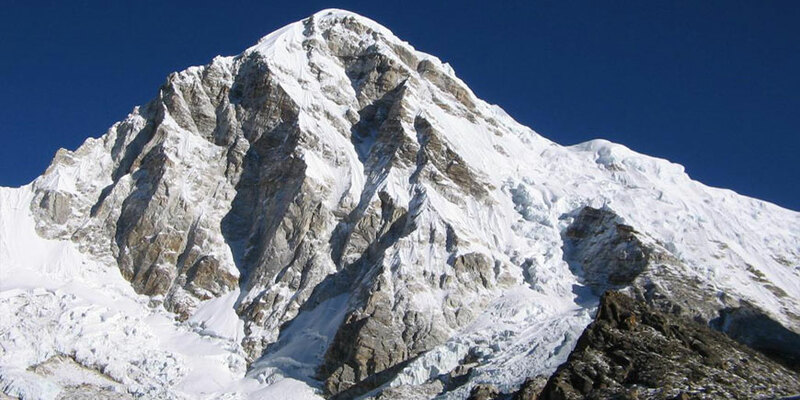 On the ridge from there to the summit Pumori offers sections of wild exposure, with technical difficulty worthy of any Himalayan alpinist, and fabulous views of views of Lhotse and Everest. Day 04: Fly to Lukla trek to Phakding (2640m) overnight in Lodge. Day 05: Phakding to Namche Bazaar (3446m) 6 hrs overnight in lodge. Day 06: Rest for Acclimatization visit khumjung, khungde over night Lodge in Namche. Day 07: Namche Bazaar to Tengboche Monastery (3867m) 6 hrs overnight in Lodge. 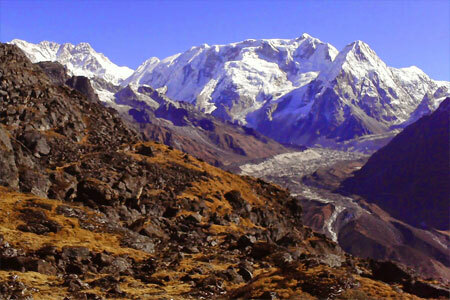 Day 08: Tengboche to Dingboche (4400m) 6 hrs overnight in Lodge. Day 10: Dingboche to Labuche (4900m) 6 hrs overnight Lodge. Day 11: Lobuche to Pumori Base Camp (5300m) 6 hrs overnight Camp. Day 30: Cleaning up Base Camp. Day 31: Pumori Base Camp to pheruche (4200m) overnight in lodge. Day 32: Pheruche to Namche Bazaar (3446m) overnight in lodge. Day 33: Namche Bazaar to Lukla (2800m). Day 34: Lukla to Kathmandu by flight and transfer to Hotel. Day 35: Rest day in Kathmandu and farewell. Day 36: Transfer to International Airport and fly home.